There's little doubt that The Legend of Zelda: Breath of the Wild is the big one coming to the Nintendo Switch at launch, while eager Wii U owners will also get a chance to play it. The big N is evidently keen to build the excitement around the latest series entry, and has confirmed a range of exciting promotions for Europe to celebrate the IP. For a basic summary, below is a promotional video by Eiji Aonuma. 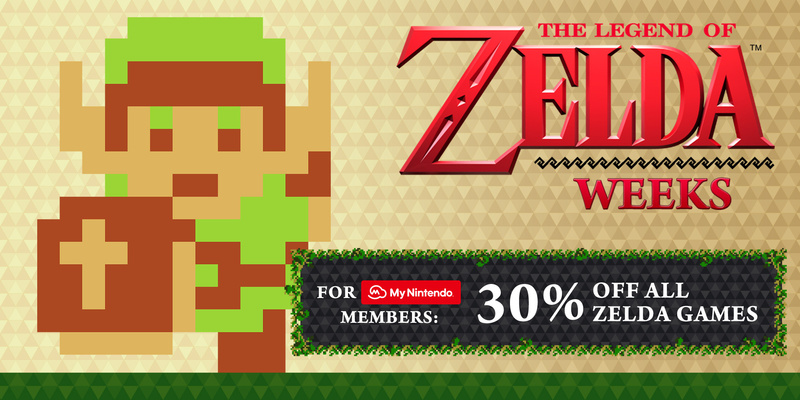 Getting into the detail, every Legend of Zelda title on Wii U and 3DS is getting a 30% discount on the eShop for My Nintendo members. This will run from 26th January to 9th February, with the list of games below. On top of this all DLC in Hyrule Warriors and Hyrule Warriors Legends will also be 30% off during the same period. Next up, the following 3DS HOME Themes will all have 50% discounts. Also, from 26th January to 31st March the following will be Rewards on My Nintendo; these have been on the North American service for a while, so it's a welcome bit of catch-up. Finally, there'll be Legend of Zelda-themed badges in the Nintendo Badge Arcade app. Quite a lot going on to celebrate The Legend of Zelda in Europe; let us know if you'll be picking up any of these upcoming goodies. Unfortunately the discount isn't enough. I own all of those games on Wii U in one form or another. I'd need a 50% discount to tempt me to rebuy any of them. Not to mention Nintendo still haven't said anything about whether they can be transferred over to the Switch. I have all the games aside from Hyrule Warriors and I'm not really interested in it so I guess there's nothing for me this time. Great for those who don't have the same situation. I think OoT3D is already 20€ since it's a Nintendo Select title so a discount in addition to that makes it a must buy if there's still someone who hasn't played OoT. I'll get the new theme! I'd love to get a discounted game, but...I already own all Zelda games on my 3DS. YES! I'll definitely pick up all of the My Nintendo rewards. Would've been helpful to list the prices next the games above. I guess it's time to get Zelda 2. I'll be picking up a physical copy of A Link Between World's. Shame you cant play SNES games on the 3ds otherwise i wouldve snatched up a link to the past. I already own alot of the rest though. I'd buy all the virtual console games if the WiiU emulator didn't have the brightness stuck on zero. Wish they released it one final time before the 3ds is dead. Nintendo rarely (or never?) drops the base price of digital games, even if they are old games, or re-releases of really, really old games. On top of that, even if those games you want go on sale (which they do seldomly enough), what you get is these 30% discounts. I bought (or should I say rebought) Dark Cloud 2 last weekend on PSN. It was the slightly enhanced PS4 version. At $4,99 instead of $14,99 it seemed too good an offer to resist. Sadly, I can't say the same about these games. The quality of the content absolutely machtes up, no doubt about it, but the value proposition just does not. The fact the VC games are really just roms afaik without any enhancements (like higher resolution, trophies or anything like it) added, only heightens this sense of being ripped-off by comparison. I own them all so it's kinda pointless for me sadly. I actually don't own most of these games, the only one I do is Hyrule Warriors for the 3DS which an absolutely superb game (and with a lot more depth than people who've never played it gives it credit). However, digital prices have never been great on Nintendo. I actually don't think many digital stores do much better... from my experience most of the highly discounted games on PSN etc. are games that they can't shift. Not an issue Nintendo has. The only one I don't own already is Tri-Force Heroes, and I don't think I would like that game at all. I have everything besides Hyrule Warriors Legends. I've got like £30 on the eShop, too, but I might hold on to my credit for Switch games, providing of course that our Switch account allows for it. What would be nice would be if they were to let people who missed the Four Swords Adventures download a second chance. Hyrule Warriors Legends DLC for -30% - yeah, I'm all for that. If this comes to NA, I'd definitely at least get the Marin DLC. I hate that it is bundled with a weapon for Linkle since I don't have her, but I'd pay for it at a discount. Now, now. Do I double dip Warriors or do I opt for Triforce Heroes? I have most of these in some form or another, so I'm not interested this time. If they ever put Four Swords for sale, then I'd happily buy it instantly. Just give me a statue to spend my club points on! Perhaps it's a sign from above for me to resume that archive binge (a glorious total of one game previously) and finally start Zelda II? Yes, it's called Wii U. Couldn't have even stretched to offer the NES Zeldas as gold point rewards? My Nintendo is awful. Normally, Hyrule Warriors, and all its DLC, costs a grand total of $106.92. Now, everything costs $74.84, which is a much better price. Alternatively, you can buy Hyrule Warriors Legends and its DLC (a $54.98 value) for $38.49, which is just below the price of the base game. If you want both games, buying everything in bundles will cost $100.74 (as opposed to $143.92). EDIT: Wow, these discounts are for Europe only? That's disappointing, since the sale starts on my birthday. Finally something to use my over 1600 platinum my Nintendo points on. I'll just save my points/money for some games on the Switch. Discounts and more discounts for games that the vast majority of players already have. Meanwhile, Microsoft is offering real deals and free games every month for those who have a Live Gold subscription. @AlexSora89 Unless you plan to online/local multiplayer, Triforce Heroes isn't worth it. The single player is unplayable. Awww, while I do appreciate the gesture, I own all of the games, either on virtual console, or on original systems... Most of those games I already own multiple copies! In all seriousness though, this is a good opportunity for newer fans to play some of these games. I need to spend my gold points. Some are going end of march. @PtM I actually own a New 3DS, so count me in on that one. Also, what exactly did 'they' do to MM? Picked up Hyrule Warriors so may look into the DLC and maybe some of the themes. i got most of the Zelda VC games I want, whilst may pick up ALTTP on N3DS once I see the price. I'll pick up the Oracles games since they are the only ones I haven't played. Shame about the Wii U deals. 30% off a lot of money is still enough not to tempt me. I own every Zelda game except for Hyrule Warriors (not interested) and the Four Swords games. A proper way to celebrate the anniversary is to put THOSE on the eshop so we can play every Zelda game on Wii U and 3DS! @SLIGEACH_EIRE You said it. I only own the Oracle games and I still wouldn't jump for these "discounts." Not necessarily saying they should do a 90% off fire sale every week, but 50% should be bare minimum (especially since they don't do price drops). Where's Four Swords Anniversary Edition? Been years since I enjoyed this multiplayer mode from the GBA Link to the Past port, and would love to revisit it solo. @allav866 I think it's much cheaper if you buy the season pass. It must include all the DLC packs if you buy it for Legends and almost everything if you buy it for the Wii U version. I might be wrong, though. Not bad if you're a digital-loving Zelda fan who doesn't have some of these games yet. reluctant to buy the few i don't currently have without knowing if they'll transfer to the switch. @SLIGEACH_EIRE Wind Waker HD, OoT 3D and ALBW are already very cheap since they are Nintendo Selects. 30% less makes them fantastic bargains. I'm going for OoT 3D for 14 euros. Already own the others. Also duly noted. I can see the game is divisive. Given my laziness prevents me from checking the review, is download play an option here? It's a deal breaker slash deal sealer... er, deal. @Uno With With HW on Wii U alone, I was counting the price of the game itself, the Hero of Hyrule Season Pass, the Legends of Hyrule Season Pass (Wii U only), the Legends Pack, and all 4 costume DLC packs. With Legends, I was counting the game and the Legends of Hyrule Season Pass (3DS only). With the two games together, I was counting the Hero of Hyrule Season Pass, Legends of Hyrule Season Pass (3DS & Wii U), and the 4 costume packs. @AlexSora89 No Download Play. Everyone has to have their own copy. If you can coordinate with other players online and add them to your Friends List, you can avoid being paired up with random players, which can be pretty infuriating when the team doesn't get along and won't stop throwing each other over cliffs. Crud. Potential deal breaker right there. @AlexSora89 Personally, I'm more of a solo player, and TFH was fun, but only when the random players I was paired up with were able to communicate with what little options they had, that, and were at least semi-competent at the game. Hyrule Warriors Legends got a lot more play time from me (second only to Animal Crossing in my Activity Log), but you have to be able to enjoy repetition. It's not for everyone, but I'm still enjoying the game just fine, and am working on the last DLC pack. I say get the game, and maybe get the DLC with it, but I would recommend playing the base game first and finishing everything the game has to offer before buying extra content that you may or may not even sink your teeth into. NOA screws us yet again, yay! Nice! Although no anti-troll option will ever beat the one Capcom did for one of their fighting games: ragequitters are eventually put with other ragequitters by the matchmaking system, which is delightfully wicked if you ask me. The choice is getting ever harder, but to me, most options point to Triforce Heroes. Mostly because I'll buy HW when I'll be able to double dip and buy the whole enchilada, like all DLC on both versions; TFH on the other hand is one single purchase, at the right price at that. @PtM Why do you have a problem with Majora's Mask 3D? I think I might double dip for Skyward Sword, altough I laready have it on disk. Should make replaying the games easier. @phreak09 yeah, that's what bothers me as well. I still need/want Minish Cap on Wii U and a couple of GB/C games on 3DS, but with Nintendo being unclear about their stance on digital ownership and stuff carrying over to Switch, I'd rather wait for another sale at some point in the future. ...I really do like Minish Cap though and it's not like my Wii U is going anywhere, so I might just pick it up in the end. Would buy Hyrule in the eShop if the discount was at least 50%. I may purchase the DLC's though as they are usually way cheaper than the game. How much does that make link between worlds? still need to play that one. Haven't played Link to the Past for years. I'll prob grab that for the 3DS. Ocarina ends up at a pretty decent £11.20 with the discount for those who haven't already picked it up. May end of getting Zelda II for £2.50 and either Ages/Seasons for £3.80 each. @adamatsu £11.20 which is decent if you don't mind not having the physical cart. @jimi I'm not saying the emotion panels weren't fun and satisfying, but it is frustrating when your teammates disconnect when they can't understand what you're saying or vice versa. And I have been paired with stubborn kids that fight over the top Triforce panel at the end of an area. Meanwhile, I'm waiting on the left panel, tapping my foot. No re- release of the 25th anniversary edition of Four Swords is a disappointment. I have it on my Japanese 3DS and want it on my U.K. one. It's ridiculous you can't get it anymore - they could just release it as Four Swords DX if the anniversary thing is some petty concern. Why can't I see any discounts yet? Already have 'em all, except some of the Wii U VC, but that's because I already own it on 3DS, or have original physical copies.